Mr. Justice Major, B.Com., LL.B. Born in Mattawa, Ontario, 1931. Son of William and Elsie Major. Married to Hélène Provencher, 1959. Children: Suzan, Peter, Paul and Steven. Educated at Loyola College (now Concordia University), Montréal, and University of Toronto. Hon. LL.D. : Concordia University, 2003; University of Calgary, 2005; University of Toronto, 2005. Called to the Alberta Bar, 1958. Practised law with Bennett, Jones, Verchere at Calgary and became senior partner in 1967. Appointed Q.C., 1972. Elected Fellow of the American College of Trial Lawyers, 1980. Counsel for the Canadian Medical Protective Association (Alberta), 1971-91. Senior Counsel for the City of Calgary Police Service, 1975-85; Counsel at the McDonald Commission re RCMP, 1978-82; Counsel, Royal Commission into the collapse of the CCB and Northland Bank (Estey Commission); Senior Counsel for the Province of Alberta at the Code Inquiry into the collapse of the Principal Group of Companies, 1987. Appointed to the Alberta Court of Appeal, July 11, 1991. 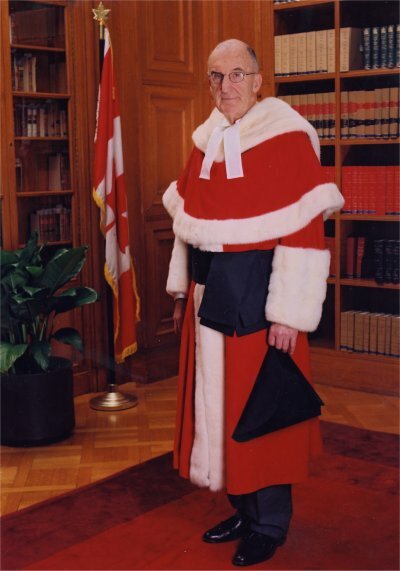 Appointed to the Supreme Court of Canada, November 13, 1992. Justice Major retired on December 25, 2005.